Clock Generator CY28RS480 For Ati Rs480 Chipset Semiconductor, Supports AMD CPU 200-MHz differential CPU Clock pairs 100-MHz differential SRC Clocks 48-MHz USB Clock 33-MHz PCI Clock 66-MHz HyperTransport Clock By Cypress Semiconductor Corp. 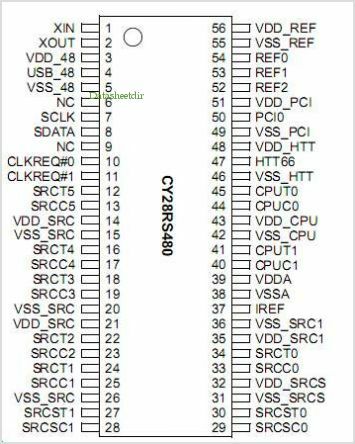 This is one package pinout of CY28RS480,If you need more pinouts please download CY28RS480's pdf datasheet. CY28RS480 circuits will be updated soon..., now you can download the pdf datasheet to check the circuits!